In 1940 CO2 levels were around 310 ppm. Since the ABC has no sense of history let's see whether similar dramatic weather extremes were reported...Using the ABC's own headlines....It was a year of heatwaves and bushfires, sun, cyclones, and melting bitumen... it was 1940! January: GREATEST HEATWAVE IN STATE"S HISTORY: EIGHT DEATHS BRISBANE, January 26. Eight people died in Queensland to-day at a result of the greatest heat the State has ever known. Three cases occurred in Brisbane and five in the country. Forty-three people collapsed in Brisbane and many more in the country. Brisbane experienced the highest temperature in its history—109.8 degrees at 2.35 p.m. 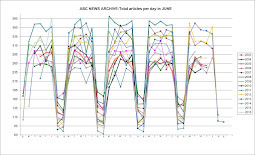 Nothing like this figure has been re-corded during the 85 years that the Meteorological Bureau has been operating. The nearest was 108.9 in January, 1902. To make matters worse, today's heat was accompanied by a record relative humidity of 20 per cent.The record day was followed by the hottest January night since 1922. The temperature at 9 p.m. was 83.3. February: NINTH DAY OF TRYING HEATWAVE. 100.4 Degrees Today Gives 5th Successive Century. BROKEN HILL today experienced its ninth successive day of trying heat. The temperature reached amaximum of 100.4 degrees at 2 p.m. It would probablyhave been much higher but under the influence of a lightsoutherly wind the mercury dropped to 96 degrèes at2.40 o'clock, and 93 degrees at 3 'o'clock. Early this after-noon heavy clouds gave indication of a cool change being on the way. Today's century was the 14th for the season, the sixth for the month, 10th for the year, and fifth in succession. March: ADELAIDE HEAT-WAVE.Seventh Successive Century.ADELAIDE, March 13.—For the firsttime in the 82 years of the State's re-corded meteorological history, a sevenday spell of heat exceeding 100deg. hasbeen experienced in Adelaide during twosuccessive summers. The record wasestablished today, when the temperaturefor the seventh successive day passed thecentury, reaching 102.6deg. A similarheat-wave occurred in January, 1939. The Divisional Meteorologist (Mr. Bromley) predicts that a cool change should be noticeable tomorrow.Today's seventh successive century equalled the March spells of 1872 and 1934. Maximum readings during the past seven days have been 103.9, 107.7, 110.1, 108.3, 107.9, 104.9, and 102.6. April: DROUGHT IN UPPER HUNTER. Never Worse. POSITION SERIOUS. Only 83 points of rain were recorded, at Muswellbrook during March, being 139 points below the.average. It is the eleventh successive month on which the fall has not reached the average. The rainfall for the first quarter of the present year was 239 points, is the lowest for that period for the last 17 years. The fall in March, 1939, was 403 points. June: SWIMMING IN SYDNEY! SYDNEY, Sunday. —Sydney had summer weather today, although winter began officially some weeks ago. The maximum temperature reached 78.1 deg. at 2.5 p.m., and was the third highest ever recorded in June. It was the warmest June day since 1931, when a maximum temperature of 80.4 deg., the highest known in June, was recorded. Many people took advantage of the warm weather to swim at the beaches. They found the water cold, but enjoyed a summer sun bath. August: WARM WEATHER.Temperature a 19-Year Record.With the country urgently in need of rain-some districts are still awating their usual winter rains-the State had a foretaste of summer warmth yesterday. In Perth it was the warmest August day for 19 years, the maximum temperature,77.5deg., being 13.7deg. above,the normal August maximum. Last night there was no immediate prospect of a break in the long spell of fine weather. THOUSANDS of pounds damage to crops, buildings, and railand telegraphic and telephone equipment was caused by thecyclone which hit the North Queensland coast on Sunday. Washouts occurred in many sections of the main coastal railway, the worst being near Proserpine, where the rails were suspended for a quarter of a mile. March: ANOTHER CYCLONE: Serious Damage In Queensland BRISBANE, Friday: A cyclone in northern Queensland has flooded rivers and creeks and dis-organised sail and road services. SWOOPING down with dramatic suddenness, record floods in the Far North have caused the evacuation of hundreds of residents.Floods are due to the latest cyclone. Ingham, Halifax, and Innisfail have suffered most, but practically all creeks and rivers are in high flood. There have been many thrilling rescues. SYDNEY, Thursday. — Heavy damage was caused by a tornadic squall which struck Sydney and suburbs shortly after 3 p.m. today. Most of the damage was done in the northern and western suburbs. A man and a boy were killed. One, of the pylons of the harbour bridge was struck by lightning and half a ton of granite, was dislodged, falling 300 feet to the ground. The velocity of the wind was officially stated at 95 miles an hour. The velocity of the wind in the tornadic squall which struck Sydney on Thursday was 95 miles an hour, and was the highest experienced in Sydney or southern Australia since authentic records have been kept. March: HEAT WAVE RECORD IN ADELAIDE Adelaide. Mar. 13.
exceeding 100 degrees has been experienced in Adelaide during two successive summers. The record was established to-day when the temperature for the seventh successive day passed the century, reaching 102.6 degrees. September: BIG FIRES RACE THROUGH N.S.W. BUSHLANDS SYDNEY. Monday.-Exceptionally hot spring days with dry winds and no apparent prospects of rain have brought an early bushfire menace to New South Wales this season. Large fires already have been reported from various parts of the State. Metropolitan and suburban fire brigades have been kept busy since early yesterday fighting outbreaks in arid bushland. Yesterday 22 fires were fought and hundreds of acres of bush destroyed. Today a fire broke out in open bushland at Hornsby, and after several hours the brigade was still fighting the flames. They were able to burn effective breaks. A series of small bushfires in the Blue Mountains near Wentworth Falls was fanned yesterday to dangerous proportions by a strong westerly wind. and firemen from several towns have been fighting the flames continuously since yesterday morning. January: HAY STACKS PIERCED BY HAILSTONES BRISBANE, Thursday. Hailstorms in Warwick, Pittsworth, and Milmerran districts have been so severe that hailstones have penetrated 2ft. into haystacks. November: Greatest Storm in memory Hail l ft. Deep At Rose Bay SYDNEY, Saturday.Streets littered to a depth of several inches with leaves and torn tree branches, and matted with hailstones, gave evidence at Rose Bay this morning of a terrific storm which struck that suburb last night. Sweeping across like a tornado, the storm was considered the worst in the memory of many residents.The noise was terrific as the wind; increasing in fury, was accompanied by torrential rain and heavy ,hail. Lightning played round the roofs of many houses. November: Tornado Wipes Out Thousands of Acres of Wheat at Peak Hill The tornado struck the Peak Hill district about twenty miles northwest of the town, and followed a track about three miles wide, completely destroying the wheat crops on more than twenty farms. On 3,000 acres not a head of wheat was left standing-. Some houses were wrecked beyond repair. On one farm a brick house was blown to pieces. Others were unroofed. One farmer had his newly-builthome wrecked, 600 acres of cropsmashed to the ground, and 20 pigskilled by enormous hailstones.